Hmm... the last change is an improvement from the illegible blue field that defined them before, but I feel the borders of the Lathanoids and Actinoids are still unnecessarily confusing. I would prefer the dotted lines. They are clear enough without being obtrusive. I sure would like to see this map "get off the ground" -- it is big and complicated, but it's also educational and appealing to the eye. We are going to start working in the Elements map. Having 118 territories and very wide this is a "supersize" map. What dimensions can we use? Any changes you might want to suggest? Making changes now is easy. Changes later on will be hard on graphics. Each territory box will have atomic number top left. Iron is "26". Abbreviated name bold top right Fe No full name so we can save space! Center far right the troop circle so it has room to grow left. Bottom will be bonus symbols. Flags left, ancients center, nuclear, biological or magnetic right. No territory has more than 2. Considering having the flags changed from starting neutrals to starting potions for up to 12 player games (there are 14 flags). 1 per player. Each player would also get random other territories. This reduces the number of starting neutrals. as given in the thread below, supersize limits are width up to 1,200 pixels, height up to 1,000 pixels for the large image and width up to 780 pixels, height up to 650 pixels for the small image. if 26 Fe is above its troop circle, then i suggest that 25 Mn and 27 Co are below their troop circles, so that there's less chance of troop overlap. troop counts with three or more digits are always centred on the midpoint of the leftmost two digits. why don't u set up the map a bit like usa 2.1, which has fixed starting neutrals on special regions, with all other regions being random start positions limited to a certain number per player (the exact amount will depend on the effect u want to achieve), with those not allocated to a player being neutral? This shows all the neutral starting positions. Player 1 would get +6 to start. 1 for every 4 terr. Player 1 is unlikely to reduce Player 2 down to 5 starting troops. What's the incentive to create maps like this and Pi? I don't get it. Nothing appealing at all. iAmCaffeine wrote: What's the incentive to create maps like this and Pi? I don't get it. Nothing appealing at all. Actually there is little direct incentive. All members of the Map Foundry are volunteers. We might hope get a free membership. So far I haven't. Coding is a serious challenge. A personal challenge. Getting 2,450 lines of code perfect takes sharp focus. Being creative and stepping out with new ideas is always risky. The greater good is to do something beyond your normal boundaries. Join a band, get a degree, learn a new language or create a new world here on CC. Last edited by HitRed on Tue Apr 02, 2019 4:46 pm, edited 2 times in total. I know Photoshop and design. How do you require 400 layers to create this map? Do you have ever period with it's own group of layers? I assume you must. I'm not a designer. I'm idea and XML. My bad, didn't realise EB was doing the graphics. I don't agree with the approach to Risk that HR and others take- just look at something and slap a CC map to it until it works- Risk Star Wars, Risk Game of Thrones, Risk whatever is on your desk, Risk Calculator, Risk poster of the periodic table, Risk stapler, etc... that's always seemed a bit gimmicky. The starting point is always just I've seen it, so I can dump a set of game rules on it. Having said that, and HR will always disagree given that the next map is just gonna be something like his half eaten sandwich, HR has put a lot of effort into this. 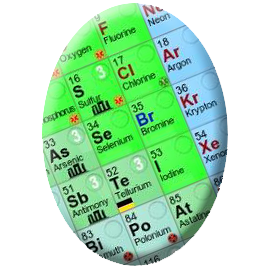 No creativity, of course- it's just the periodic table, largely uncredited and with a game that he did not create applied. I don't think it's fair to say that he didn't put work into this though. The coding was probably time-consuming. I don't mind some complicated maps, they add unique gameplay and there are enough geographical maps to please the masses. It's just things like this and Pi are a step too far imo. 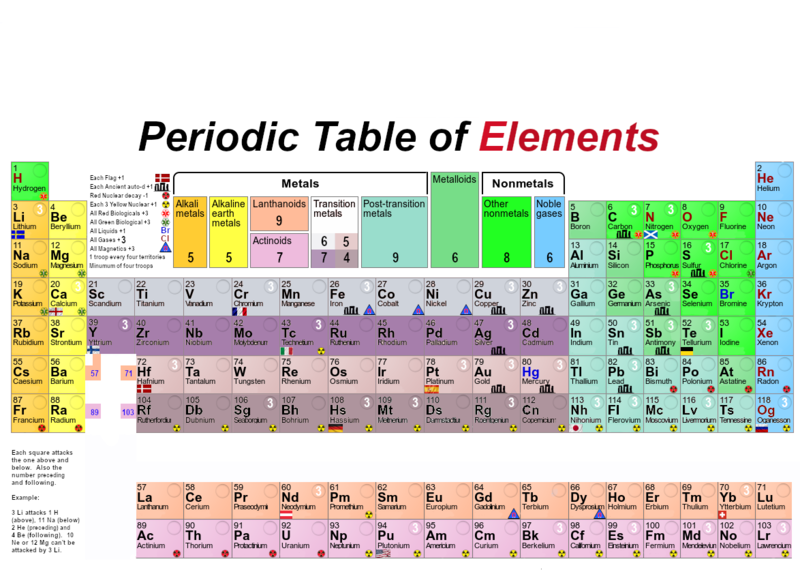 This Elements map is colorful, graphically fascinating, and quite educational. I like it for those reasons alone. If it's actually playable, all the better. As HitRed said earlier, "Elements will likely be the most, or one of the most, graphically complex maps ever on CC." 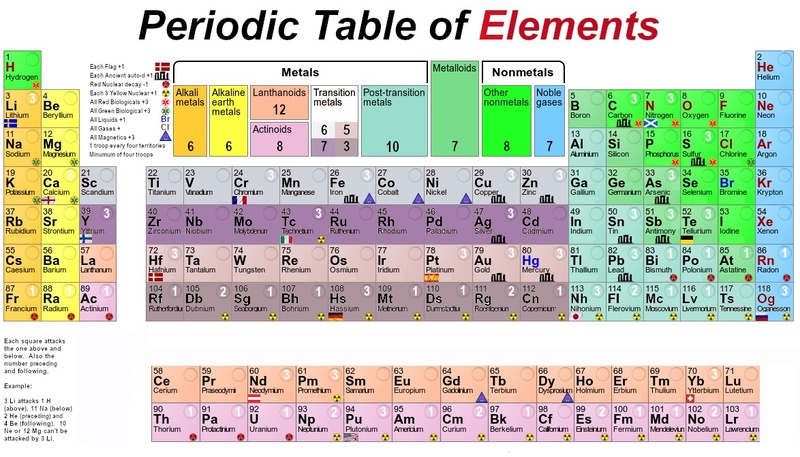 I've been interested in the Periodic Table of the Elements since middle school, way back when Lawrencium (atomic number 103) was the most recent synthetic element. I suppose that dates me a bit. I doubt if there will be another map after Elements. Hard to imagine anything topping it. I fixed all the code for Switzerland. Seems to be dead now. That's ok, as it was already abandoned. I also volunteered to code another map. No response yet. I'm not into creating maps with wizards and castles. I wanted to create Unbalanced Maps but got no love on those. Some of the best movies I could remember were by John Hughes. He made films everyone could relate to. Mostly high school, teenager movies. So they had mass appeal. I'm doing the same thing. Looking back at common early age experiences we are all familiar with. With a math science theme. Do we have a basketball map? I briefly considered a small basketball map where winning was holding both baskets. 15 terr. Holding 1 basket would be +5. Holding both baskets would win. The "players" would shoot into the baskets on their perspective side and bombard the players on the other side of half court. So in a way you could go offense (basket) or defence (bombard the other side) on your turn. 5 shooting positions on each side of the map. The Ref in the middle would allow movement from one side of the map to the other. Killer neutral easy 1 for lots of cross court action. Taking the Ref you could assult the players on the other side. Simple quick kill game. To keep each player from stacking shooting positions would be -2 (like the shot clock effect). So offence will be high tempo. Easy graphics sky view of the court. Or from the stands view for a more 3D look. To make it more fun I'll name the players after foundry volunteers. Iancanton, EBConquer, Captn B, HitRed. We need one more...hmmm. Might be a problem. Riskllama was always positive. The other team will be named after Duke, Evil S, Mitts, Groovy S. and Swifte. Last edited by HitRed on Sat Apr 06, 2019 5:01 pm, edited 2 times in total. I'm all for maps that are more fact rather than fiction, I just think maps like Pi and Elements will only appeal to a very small demographic.